Three Poems by Lynda McKinney Lambert: "Along the Road," "White Snakeroot," and "Autumnal Mornings"
(Previously published in Sparrowgrass Poetry Forum: Anthology and Lambert's latest book, "Walking by Inner Vision: Stories & Poems." ). on her leaves, but she won’t bite! One for the Holy Ghost. at the end of each tiny branch. with faceted black seed beads. of soft white silken hairs. beneath hearty leaves along the well-worn pathway. Tread lightly through the grass. 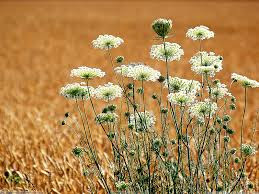 display the Queen-Anne’s Lace in full bloom. on the warm Autumnal breeze. floral dancers on a late-summer stage. Give them a standing ovation.